LOUISVILLE, Ohio — A fourth-generation dairy farmer, who is no longer able to make a profit in the changing industry, is calling it quits. 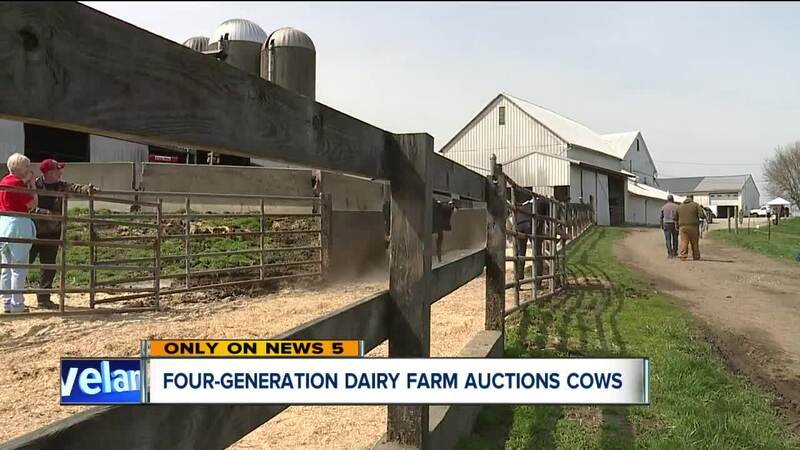 Dwight Raber, of Raber Dairy Farms in Louisville, auctioned off more than 200 of his dairy cows and much of his equipment on Wednesday morning. His farm, which has grown to 500 acres (200 hectares) over the years, was founded by his great-grandfather who came to the U.S. from Switzerland in 1891. Raber didn't want it to end this way, but felt he had no choice. "It feels very emotional. I didn't want to cry here, but it's emotional," he said. The farmer was getting an average of 90 pounds of milk per cow per day, which he considered good production, but no longer profitable in a business where milk prices are lower than the cost of producing it. "We've borrowed $200,000 in the last couple of years to operate. We couldn't just keep doing that." Milk prices have been depressed for the last few years. Raber said part of the problem revolves around mega farms in Michigan bringing in milk at less than market rate, making it hard for family farms to keep up. "We were large at one point and some of them went to 1,000 cows, 2,000, now the they're up in the 10,000 and we can't compete," Raber said. The demise of local dairy farms is part of a trend both nationally and in Ohio. According to the Ohio State Extension, there were 2,312 licensed dairy farms in the state in 2017. In January of 2019, that number dropped to 2,045. Statistics from this month show there are 1,994 farms remaining. Nationally, 2,731 dairy farms have stopped operating over the past year, a decline of nearly seven percent. "It's sad. I'm sad about it. A lot of family farms are going to be gone," Raber said. Raber said he will now focus on selling beef cattle, soybeans and wheat. But with dairy farming drying up after more than 100 years at his family farm, he feels like it's the end of an era. "It's hard to let it go," he said.